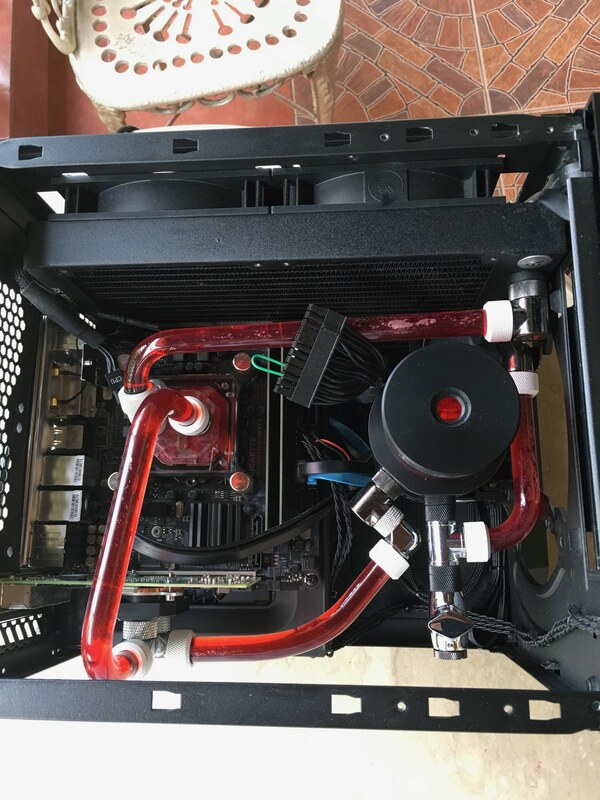 What kind of cooling and case options would you recommend for this build? Noise and energy consumption are not a concern. I want to keep my system cool and functioning at optimal levels. Also, I don't know how much VPN traffic that I will be running, but can you suggest a good resource that shows how to VPN traffic affects temperature? Not really advisable and the cost of custom water cooling is more than the parts of building a Pfsense. It just happens I have some extra water cooling parts lying around. Thanks. I was definitely not planning on water cooling. What about fans? How many and what speed? Also, any recommendations on a case? I'm okay with the current one except that it's heat sensor will go to the board. I would like to know the temperature of my system. That Kaby has a 51watt TDP. I doubt it's going to generate big heat. I use a 7320 Kaby (same TDP) on a Gigabyte ITX board and just use the stock cooler on it. Water, even an AIO, is not needed. Run one 24/7 and it will fail in the middle of the night. Trust me on that one. If you have a dual NIC like an Intel on there, it's probably making more heat than the proc... I bought a Corsair Carbide 400C because of the hinged door and the ability to use 140 fans instead of 120 (a little quieter). One 140 on the front blowing across the motherboard, a 120 at the back to exhaust, and the top is mesh with a removable screen for heat to escape. I ended up using it for my kitchen PC and going with an ITX case to save space in the server area cuz my tiny ITX motherboard got lost in this case. But it's a nice case as long as you aren't stuffing it with quad sli and 10 hard drives. There is space on the backside for SSDs and the 3.5" drive tray holds 3 drives, with room to add a dedicated 140 fan to blow on the drives. Have a look at the Fractal Design cases: https://www.fractal-design.com together with Noctua FANs they are pretty awesome. If you want to extend your build to a big VM host the Define R6 is really nice with plenty of space for disks, and you can use the 5.25" bay for a temp/fan monitor of your choice.